Can I stop Windows 7 to store and show recent programs? I don't want my boss to know what programs I was running when he borrows my computer. Right-mouse click on the task bar and select "Properties". You will see the "Taskbar and Start Menu Properties" dialog box. 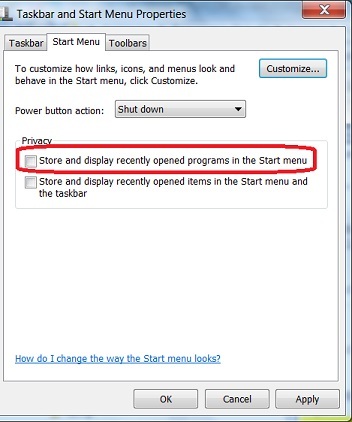 Click "Start Menu" tab and uncheck the "Store and display recently opened programs in the Start menu" option. Click "Apply" button. Windows 7 will stop storing and showing recent programs from now on.